Genesis Health Club opened its doors in 1986, in a single location at 13th & West Street, on the west side of Wichita, Kansas. In 1994 Rodney Steven II, current President and Owner of Genesis Health Clubs, purchased the business. Rodney attended Southern Illinois University in Carbondale, Illinois on a tennis scholarship and upon graduation, he continued to follow his vision of pursuing a healthy lifestyle and helping others in his hometown do the same. He recognized the need for a fitness center that was focused on top-quality customer service and personal attention. It was from this early vision that the service-oriented, results-based training model was born, and Genesis Health Club anchored its rightful place in the fitness industry. Our goal from the beginning has always been to provide the best customer service possible and to help our members achieve their health and fitness goals with the best program and facilities available. We love what we do, as our passion for health and fitness is growing stronger than ever. GENESIS HEALTH CLUBS will continue to grow, change, innovate, add new services and even add new locations in order to provide the best customer service and facilities possible to our members. Our motto is and will remain Results. For Life. Immediately after purchasing the West 13th location, Rodney started small renovations from painting all the walls himself to laying new flooring. As business started to grow by building strong relationships with the members, he continued improving the club daily and then equipment upgrades were made. In December of 2003, a devastating fire engulfed the entire club and the building was burnt to the ground. Plans were made instantly to rebuild the location bigger and better for the club’s most loyal members and a temporary location was founded to service members during construction. West 13th was rebuilt and re-opened in 2006 and now features a beautiful three story building, a landmark in west side of Wichita. As the first and original Genesis Health Club, it will always remain as the starting foundation of our members. In December 1996, on the day after Christmas, the East Central Genesis Health Club location opened. Prior owners of the racquetball and fitness facility at 6100 E. Central had decided to close their doors permanently, and Genesis moved quickly to purchase the facility. Went through a quick facelift over Christmas and worked hard to attract the existing members to allow them to rejoin with their memberships. The club has undergone several remodels and one large renovation that included an addition to the building. A cardio mezzanine was added, new nursery, smoothie bar, and renovations were made to the men’s and women’s locker rooms. Corporate offices were also added and East Central remains the corporate hub for all Genesis Health Clubs operations. In 1998, Genesis began to explore options of growing further west. Meanwhile, working with Via Christi in Rehabilitation and developing a relationship with them, an opportunity came to purchase their fitness center. On September 13, 1999 the center at 854 N. Socora became the Genesis Health Clubs West Central location. A huge renovation was underway immediately that included expanding and upgrading the cardio area complete with cardio theater, adding tanning rooms, and a 6,000 sq. ft. expansion of the weight room with new weights and new circuit training equipment. As the member base grew, so did the facility. In 2010 a second floor was added to include a large mind/body studio, private Pilates studio, cardio and stretching area. A large tennis expansion followed in 2012 to add five indoor courts to the building as well as tennis viewing areas upstairs and down and tennis pro offices. West Central is home to our largest senior membership base. The initial relationship with Via Christi Rehabilitation that was started there helped cultivate VC rehab facilities for the future in both the West 13th and Rock Road locations. In early February, 2001, Genesis made its largest purchase to date with the acquisition of the Wichita Racquet Club. After exploring options of growth and with goals to move further east in Wichita, the opportunity to purchase the racquet club came about. Rock Road quickly became Wichita’s premier health club and added new features to membership including an outdoor pool and tennis facilities both indoor and outdoor. The fitness area was expanded and upgraded to turn what was once a tennis facility into a full service health club with a strong emphasis on tennis. Rock Road is Genesis largest location at 141,000 sq. feet under roof. Tennis remains a major focus of this location and Genesis was thrilled and excited to have the opportunity to meet and exceed the players’ expectations of keeping and making tennis the wonderful sport it is. Continued upgrades and remodels have been made to this location including new locker rooms, an added studio that now houses Genesis’ own heart rate interval training workout, All American Training, and renovations to the third floor introduced a large private Pilates training studio as well as a barre studio. Rock Road also features several businesses within the club for members’ added convenience. Salon Knotty is located inside the club and is a full service upscale salon and day spa. Genesis Massage offers several types of massages to choose from and All American Dave’s Restaurant and Meal Prep allows members to plan meals, take to-go after their workouts or dine in enjoying healthy menu of macronutrient balanced portions. Genesis began its growth outside the Wichita market with the purchase of a large shopping center at 412 E. 30th Street in Hutchinson, KS. A temporary workout facility filled a portion of unleased space while construction began on what is now the health club. The club has many features including two group fitness studios, Pilates/yoga, cycling, a high-tech cardio area with individual TV screens, racquetball court, a comprehensive strength and weight training area, and luxurious locker rooms. As membership increased, an additional group fitness studio was added to accommodate growing trends in group exercise classes. Upon completion of the Hutchinson facility, Genesis next endeavor was to purchase a very similar 95,000 sq. ft. shopping center in Salina, KS and embark on a $7 Million dollar remodel and addition to the shopping center. The building at 1808 S. Ninth Street is now home to a 65,000 sq. ft. health club and tennis facility and an additional 25,000 sq. ft. were added to accommodate five indoor tennis courts. Bringing an indoor tennis facility to Salina was important to Genesis as there is so much young talent in the community. The club includes a Grand Slam viewing area similar to the Rock Road and West Central locations and allows parents to watch as their kids take lessons and also serves as a great social area for club parties and events as well. The Salina location is host to one of the best Personal Training teams in the region as well as a large variety of Group Ex classes that remain consistently popular. In February 2010, Genesis acquired Walburn’s Fitness & Wellness and opened a seventh location in Emporia, KS. Walburn’s was a small family owned fitness center that had been in business for close to 30 years. The club offered cardio equipment, weights, one group fitness studio and several tanning beds. Genesis purchased both the business and building in the acquisition. Plans were drawn immediately to begin a remodel and expansion to accommodate more equipment and added amenities. A cycling studio was added in the basement of the club, the weight room was expanded with all new weight training equipment and new locker rooms were added and outfitted with steam rooms. Genesis’ relationship with the Walburn’s also lead to the acquisition of their McPherson location in 2012. Genesis Health Clubs in Emporia & McPherson has maintained the Walburn family’s mission of ‘Striving to Build a Healthy Community’ and continues to do so today. This acquisition ignited a trail that lead to several more club purchases for Genesis. As Genesis grew outside the city it originated for several years, the opportunity arose to add a fifth and final location in the Wichita region. A downtown location had been explored in the past, but in late 2010 the City of Wichita sent out requests for proposal for a management contract at the Wichita Ice Center. After years in the red, the Ice Center desperately needed both a makeover and new management with goals to grow ice sports in the city. Genesis owner, Rodney Steven II, had recently purchased the Wichita Thunder hockey team under Steven Brothers Sports Management LLC and recognized a need for youth in the community to learn to skate and follow in the footsteps of the Thunder athletes. A partnership was formed with the city, and along with a remodel to the first floor of the center a health club was added in the upstairs space. Pucks Sports Bar replaced a large ill-equipped kitchen area and group ex classes now take place in a studio that once held a weekly dance class. The club includes a cycling studio, cardio that looks out over the city, locker rooms with steam rooms in each and a great space for those who work downtown to get a workout in over the lunch hour or after work before heading home. Over the summer of 2011 Genesis acquired two locations formerly known as Maximus Fitness in Lawrence and Leavenworth, KS. Several negotiations between Maximus owners and Genesis resulted in the purchase of two of the five locations. The remaining three were also acquired three years later. Both locations were located in large shopping centers, Leavenworth in the Leavenworth Mall and Lawrence in the Hollywood Square Plaza in South Lawrence. Up until this point, Genesis had owned each building that housed a Genesis Health Club with the exception of the Wichita Ice Center. Because of the extensive remodeling and upgrades needed to both facilities, they began to explore options to relocate into new facilities. The following spring property was purchased at 2924 S. 4th Street Trafficway, (a former grocery store) in Leavenworth and the space underwent construction to house the state-of-the-art facility it is today. After years of failed negotiations with the owners of the Lawrence South building, Genesis made the decision to purchase the KU Jayhawk Tennis Center in late 2015 and fulfill two longtime goals, to give south Lawrence members a new, beautiful and spacious club and to offer Genesis tennis in Lawrence. A health club was added to the facility which opened in June of 2016, and as owner, Rodney Steven II stated, “We finally feel like we have the opportunity to serve our members at this location in the way we are known for!”. The McPherson location was acquired from the Walburn family, in November, 2012. The Walburn’s were managing the McPherson Athletic Club from a retail space on Main Street. Immediately after buying the business, Genesis purchased a property just down the street and began a two million dollar construction project. Members were moved to the new club a year later. McPherson is Genesis’ smallest market. Shortly after establishing the first location in Lawrence, the need for a second location was recognized. Genesis purchased the Lawrence Athletic Club in December of 2012, a club that had been in business for just over 27 years. The facility had endured several remodels and expansions over that time which led to the toughest construction project in Genesis history. The club was renovated in sections to maintain as much access to equipment and classes to members as possible. Upon completion, members now enjoy a large cardio deck with views of the city, a more cohesive weight room design, refinished basketball court, new locker rooms, renovated pool area, and a completely new layout of the entire facility. The smoothie bar behind the front desk also serves as a bar in the evenings for members to enjoy a drink after their workout and catch a ball game in our lobby. The St. Joseph Tennis and Swim Club in St. Joseph, Missouri recognized a need for help in 2013 with their aging facility on the Belt Hwy. The club included indoor and outdoor tennis courts, a lobby and viewing area and an outdoor pool. Genesis Health Clubs purchased the club on November 13th, 2013 and also purchased an additional two and a half acres of land to the north of the facility for fitness expansion. A temporary gym was added to the tennis viewing area and group fitness classes began on courts not in use and also outdoors for as drawings and initial groundwork for the project proceeded. The $6 Million dollar addition includes a full service health club added onto the tennis courts with large cardio and weight room floors, a Kids Club childcare area, two group fitness studios, and indoor pool, basketball court and locker rooms. The tennis courts were also given a facelift with new lighting and resurfacing of the courts. This investment into the St. Joseph facility not only made Genesis the best health in tennis center in St. Joseph, but also the entire region. On May 15, 2014 Genesis Health Clubs purchased both Ozark Fitness Centers located at 1249 East Battlefield and 1828 North Glenstone in Springfield, MO. The clubs had been in operation for over 30 years and were previously owned by Dan Martin, a good friend of Genesis owner Rodney Steven II. Both clubs included a tanning franchise businesses within the facilities called ‘The Tan Company’. The south club underwent a remodel quickly after the purchase and the entire facility was updated. The location now includes an added indoor swimming pool, expanded cardio and stretching space as well as fully renovated locker rooms. The north club also received some updates to equipment. Just a few months later in the summer of 2014, Genesis acquired the remaining three Maximus Fitness locations in Topeka, Kansas. The locations are located in the north, southeast and southwest areas of town and the purchase included the southwest, (Wood Valley), building and land. The north facility underwent a complete remodel that was finished in early 2016. That location now houses two group studios, a small track and multi-function training room, the locker rooms were relocated and expanded and the entrance was remodeled. The Wood Valley location, a former racquet club with a fitness addition, has been a staple in the tennis community for decades and the purchase of the club allowed Genesis to retain several amazing tennis professionals and tennis enthusiasts. The facility is currently undergoing a large $7 Million renovation. Genesis focus for this project is to marry the fitness and tennis aspects of the club and provide an open floor plan that both encourages and motivates members. This will be one of the finest facilities Genesis offers and one that will serve Topeka proudly for years and years again! Genesis had long awaited entering the Manhattan, Kansas market and finally seized an opportunity in early 2015 with the purchase of MAX Fitness clubs on the east and west sides of town. Neither location included buildings with the acquisition, so for nearly a year the club looked for land that would be home to a new, larger, tennis inclusive facility. A plot of land on the hilltop of 2704 Allison Avenue and 0000 Fort Riley Blvd. has been purchased and a 65,000 sq. foot health club is planned to break ground soon. The club will include indoor tennis courts, an indoor pool, basketball court and track as well as the same great amenities already offered at both existing locations. This location will be only the fourth location to be built from the ground up. Just a month after the purchase of the Manhattan location, Genesis made its ninth club acquisition in nine months. 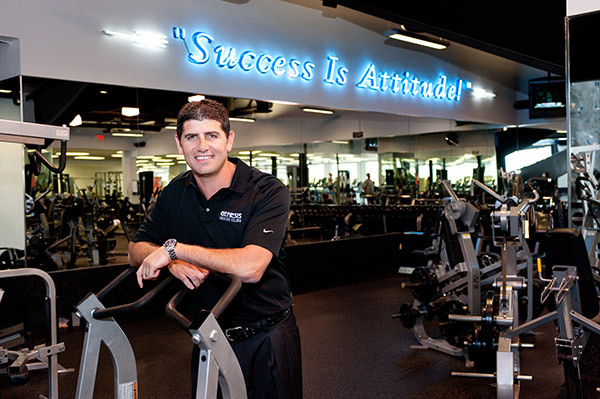 Midtown Athletic Club in Overland Park, Kansas was bought by Genesis in March of 2015 and became the company’s first location in the Kansas City market. The facility at I-435 and Metcalf is a KC landmark for tennis and fitness. Genesis has plans to invest $11M into the facility to expand and renovate the entire building. Upon completion, this premier club will be the largest and most prestigious club in the Kansas City area. Genesis made its largest acquisition in club history in the spring and summer of 2016. Four corporate owned Golds Gym locations in the Kansas City market in Liberty, MO, Lee’s Summit, MO, Kansas City, MO and Olathe, KS were purchased in late April. Six weeks later, Genesis purchased thirteen 24 Hour Fitness locations, (eight in the KC metro and five in Omaha, Nebraska) and six additional corporate owned Gold’s Gym locations, (two in Omaha, Nebraska, two in Lincoln, Nebraska and two in Tulsa, Oklahoma). Three of the Kansas City 24 Hour Fitness locations were closed several days after purchase because of both their proximity to nearby Genesis clubs and also to allow Genesis to invest in buildings they hope to own in the future. Currently re-branding and remodel projects are in the works for all of these new locations. The Westroads location became the newest club in Omaha. Formerly Nebraska Elite Sports and Fitness, the 108,000 square foot facility was acquired by Genesis Health Clubs in December 2016. The Westroads gym offers a wide variety of well-maintained weight training tools, including free weights and weight machines, cardiovascular equipment and fitness gear. Special amenities include an indoor swimming pool, an indoor running track, basketball court, volleyball court, tennis court and a cycling studio. Pamper yourself with ultimate relaxation by unwinding in the hot tub, dry sauna or steam room. We also provide full-service daycare to ensure your child is taken care of during your time at the gym. An experienced staff of group fitness instructors lead daily classes that address a wide range of target areas. Group classes range from weights to cardio and yoga depending on your personal exercise preferences. Grand Opening of the fully renovated Genesis Health Clubs in St. Joseph, Missouri. Genesis purchased the former St. Joseph Tennis and Swim Club in November of 2013. A $6 million remodel and addition transformed the facility into one of the largest and most luxurious health clubs in the region. Amenities include spacious weight training and cardio areas, stretching and functional training area, an indoor running track, two group fitness studios, and an indoor swimming pool. The newly remodeled, upscale locker rooms include steam rooms in both the men’s and women’s facilities, towel service, and an assortment of high-end personal care products for member use. You can also relax and unwind in the hot tub or dry sauna. The Joseph gym offers daily group fitness classes for every interest and fitness level for yoga, cardio, cycle, strength training, water exercise, Zumba, boot camp and much more. Genesis Health Clubs acquired the HealthRidge Fitness Center in March 2017. The Ridgeview location in Olathe, Kansas, offers a state-of-the-art gym and athletic center, an indoor track, Genesis CrossFit, day spa, indoor and outdoor pools, an outdoor fitness trail, basketball courts, racquetball and child care. Genesis CrossFit is a strength & conditioning program with a mix of aerobic exercise gymnastics (body weight exercises) & olympic weight lifting. The workouts are comprised of constantly varied functional movements performed at a high intensity. Genesis Health Club announced the acquisition of Miramont Lifestyle Fitness, with three locations in Fort Collins, CO and one in Loveland, CO. With a decades long history as a leaders in tennis, fitness and youth programs in the state of Colorado, the Miramont clubs were a natural fit for Genesis Health Clubs. The move represented the first expansion of Genesis Health Clubs into the state of Colorado and its first clubs outside of the Midwest. The clubs feature indoor & outdoor tennis courts, indoor and outdoor swimming pools, CrossFit, spa, indoor running tracks, childcare, a pre-school and extensive youth camp activities and programming. With a storied history in tennis and fitness in Lincoln Nebraska, the Lincoln Athletic Club, formerly known as the Lincoln Racquet Club, was welcomed into the Genesis family in December of 2016. The massive 88,000 square foot facility contains an indoor track, collegiate sized basketball court, indoor and outdoor swimming pools, three group fitness studios, indoor and outdoor tennis courts, racquetball, multiple steam rooms, a hot tub, massage therapy center, tanning rooms, meeting rooms, a kid’s gym, nursery and pro shop. Genesis moved quickly to expand the weight room, bring in new equipment and add an All-American Training studio to bring Lincoln the heart-rate based interval training crazy currently sweeping the Midwest. Further solidifying its presence as the leading fitness provider in Kansas City, Genesis Health Clubs acquired both World Gym locations in Kansas City and quickly began a series of improvements to the equipment and layout, with many more to come. Rechristened KC Racquet Club, the Merriam location is a perfect fit for the winning Genesis formula of rehabilitating, remodeling and growing major tennis centers to act as a fitness hub in each of its markets. Just a few short months after its expansion into Colorado, Genesis Health Clubs announced another acquisition in the city of Fort Collins, the aptly named Fort Collins Club. Featuring indoor and outdoor pools, outdoor volleyball, a café, pickleball, squash, handball, barre and Pilates, the 55,000 square foot facility represented another step forward for Genesis in Colorado. Immediate upgrades were performed, expanding the weight room and bringing in new equipment for a all to utilize, with more upgrades and remodeling planned for the near future.